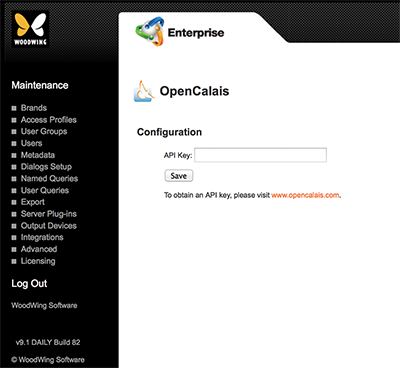 The OpenCalais Maintenance page in Enterprise Server 10 is used for configuring the OpenCalais API key as part of setting up the auto-suggestion feature for adding tags. Enterprise Server requires this key in order to communicate with the OpenCalais service. Figure: The OpenCalais Maintenance page. Troubleshooting: why does OpenCalais not appear on the Integrations page? The OpenCalais icon is only available on the Integrations page when the Server plug-in "OpenCalais Suggestion Provider" is enabled. Step 2. On the page that appears, click API in the menu and follow the instructions.